The efficiency of an organization and the well-being of those working within it are often dependent to a large extent on the social skills deployed by certain key personnel. The analysis of these skills and the training of people in their use had reached a stage of considerable sophistication. 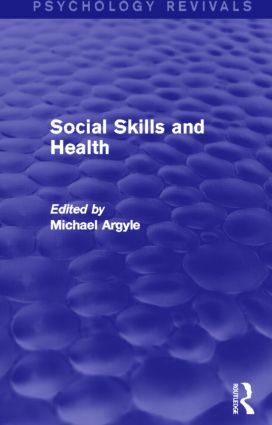 Originally published in 1981, this volume, edited by the foremost authority in the field, presents a wealth of ideas and information on how best to employ social skills training in health and welfare agencies that are still relevant today. The introduction describes the processes of social interaction in which social skills consist, introduces the social-skill model and shows how social competence is assessed and how the most effective social skills are discovered. Subsequent chapters deal with the social skills required of nurses, doctors, psychotherapists, social workers and those charged with child-rearing. There is a chapter which gives an account of the social skill problems of mental patients and the extent to which social inadequacy is responsible for their other problems. The final chapter discusses the main techniques of social skills training, and reviews their success in the light of follow-up studies. The book will be of historical value to all those concerned with the training and performance of personnel within the health related professions and to those with an academic interest in the psychology of human relations.